The Shooter is Annette K. Olesen’s first shot at a political thriller. The director is mostly known for her emotional dramas – some have even won awards in Berlin. 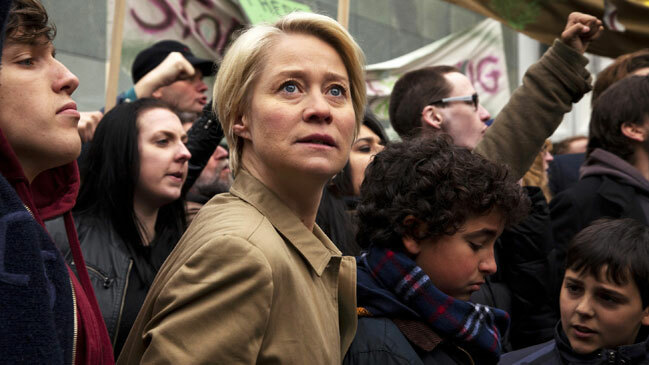 But the TV series Borgen taught her a lot about working with a political plot and she now gives the genre a workout in a new film that reminds us how fragile democracy really is. The Danish government has made a deal with the US to drill for oil in Northeast Greenland. Having campaigned on a green climate platform, the government now tries to sell the idea to the public as an eco-friendly initiative. Mia Moesgaard (Trine Dyrholm), a journalist and political commentator haranguing the government for breaking their promises, is soon whirled into a political activist’s struggle to thwart the deal and make the politicians keep their promises. The Shooter’s story could be happening right now. At a time when political activism, terror, climate change and demand for oil set the global agenda, the plot of Annette K. Olesen’s new film is nothing if not of the moment. For Olesen, the film marks a real change of genre. The award-wining director’s past films mainly dealt with what she calls straightforward realistic stories centring on personal, emotional dramas – witness Minor Mishaps, In Your Hands and Little Soldier – but The Shooter is a genre film, a political thriller about power, money, oil, ethics and idealism. The journalist Mia Moesgaard is torn between concealing and revealing the identity of the shooter, whose case she supports. As his methods grow more extreme, her involvement gets more complicated, both ethically and legally. Olesen warmed up for The Shooter without even knowing it, in 2010, when she directed four episodes of national broadcaster DR’s drama series Borgen. The series, which revolves around the political drama being played out in the corridors of the Danish parliament, taught Olesen to balance political substance and the personal side plots of various characters. “I learned what you need to tell to get a political plot up and running. What exactly needs to be said to make it credible without overdoing the political element so much that you lose the part of the audience that doesn’t want to deal with so much political talk,” Olesen says. As she admits, her own political engagement might well have got out of hand in The Shooter, had it not been for the lessons she learned making Borgen. As with Borgen, going into a predefined world was an exciting challenge for the director. For inspiration, Olesen glanced at older movies like the Swedish director Bo Widerberg’s 1976 thriller Man on the Roof and more recent, sharper-edged action thrillers like the American Bourne films. While the former is largely character driven, a film like The Bourne Identity resides at the other end of the spectrum, with its frenetic, plot-driven action and a budget many times bigger than any Danish film budget. “It was all about priorities: Where do we spend the production money? Where can we tweak the genre and use the characters to tell the story, while still nodding to films like the Bourne franchise. It was actually a lot of fun,” the director says. At one point, she cut a wild, expensive car chase through the streets of Copenhagen in favour of an intense, adrenalising scene of Dyrholm’s protagonist suspecting she is being followed. The activist consumed by his cause, the eponymous shooter, is a complex character. As portrayed by Kim Bodnia, he’s fairly normal, even compassionate. On the other hand, he goes to extremes for a cause that’s actually sympathetic enough but that most would probably prefer to see solved in a democratic way. The problem is that the story’s politicians let the people down, Olesen says. Remarkably, the film’s script is 35 years old. It was written by the Danish author Anders Bodelsen in 1977 – before the assassination of Swedish Prime Minister Olof Palme, before 9/11, terror threats and school shootings – and was made into a film the same year starring Jens Okking as a trigger-happy no-nukes activist. It was a peak year for the debate about atomic power. Even so, the notion of a mentally unbalanced sniper with a loose trigger finger seemed like a bit of a stretch in Denmark at the time. Frighteningly, the plot that unspools in The Shooter is more realistic today than when it was written. “In the old version of The Shooter, it’s clearly all a game. The filmmakers were spinning fantasies. It’s all fun and games. A fabricated scenario that wasn’t close to being real. We had to adjust for that in our version of the story, retelling the story for a world where this kind of thing is all too real and not something you fiddle around with for fun,” the director says. When Olesen and her screenwriter, Åke Sandgren, started reworking the old script, oil drilling in Greenland was still a castle in Spain to most Danes. “You don’t have to go very far back before no one had any clue the Arctic would become such a strategic and economic hotspot,” she says. Today, very few people would doubt Greenland’s key role when it comes to fuel resources and the climate. It’s a subject Olesen thinks deserves a lot more attention. But we do and that’s the germ of the problem. It’s what Mia, herself a former political activist, can relate to in the shooter’s worldview. “The film’s discussion is about how vulnerable democracy is but also about how far you should go to defend a democracy that doesn’t fulfil its democratic duties,” she says. In The Shooter, Olesen confronts us with a human and ethical dilemma, one the entire world community has to ponder. Annette K. Oleson, 47, won a Blue Angel at the 2002 Berlinale for her first feature, Minor Mishaps, a sardonic family drama based on an improvised script in the Mike Leigh tradition. The Berlinale also selected Olesen’s Dogme-tinged prison drama In Your Hands (2004) and Little Soldier (2008), about a traumatized female soldier returning from Afghanistan – both films featuring Trine Dyrholm. Olesen graduated in direction from the National Film School of Denmark in 1991.